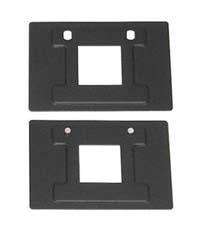 Set of two metal glassless 126 negative format inserts for use with the #LPL00100 Universal 6x7 Glass Masking Carrier as used with LPL, Saunders/LPL, and Omega/LPL medium format enlargers. The inserts replace the top and bottom glass in the carrier to create a glassless 126 negative carrier with masking. Glassless inserts for 35mm and 110 negatives, and 35mm mounted slides are also available.